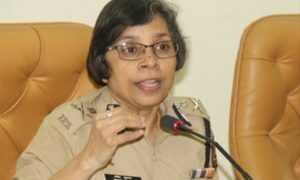 Pune 30 Jan 2018 (PCP NEWS) : Today efforts of police resulted fruitful to rescue a Giant Eagle, which was trapped in Kite thread at the top of the Nilgiri Tree at about 60/70 feet distance from ground in the bungalow of Sanjay Kumar, Additional Director General of Police State CID, here this morning. Sanjay Kumar today saw this Giant Eagle in the morning, which was trapped on a height of 60/70 feets and trying to get rid of the kite thread, but the Eagle couldn’t get free. So the ADG immediately called the constables on duty. 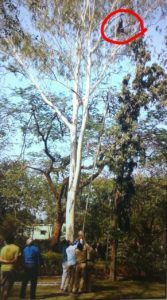 Since the Niligiri Tree is always weak and it is not possible for humans to climb, so the constables brought a big bamboo. Since the bamboo couldn’t reach near the Eagle, the ADG called the forest department. 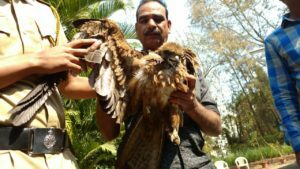 But as usual the forest peoples were not available in time, but in the mean time Efforts to release the Eagle were continued from ASI Dilip Pandit, Police Havaldar Ramdas Bangar, Daniel Girkar, Police Naik Jalinder Lavand, Constable Sunny Kumar Jadhav and Prakash Kadam. 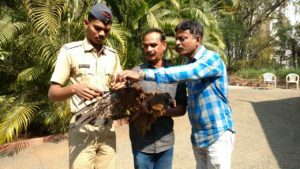 After attaching another bamboo, the Police team succeeded to bring down the Eagle, when it was on ground everyone was surprise to see, since it was a Giant Eagle having big nails which might have resulted harmful to any wrong deed done with him. But it was harmless since it had spend much energy to release himself. 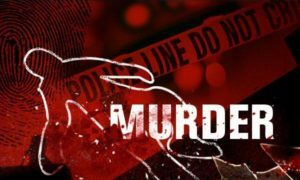 The Police team and Adg with his family were much happy when their efforts resulted fruitful. Then it was informed to Peshwe Park Zoo Authorities, who arrived at the bungalow and got the custody of this Giant Eagle.